Location: Jenkinstown in County Kilkenny, Ireland. 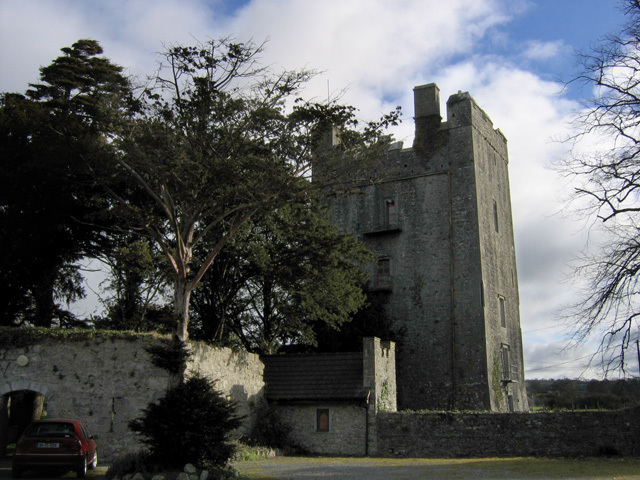 Notes: Foulksrath Castle (Irish: Caislean Ratha) is a 14th-century Anglo-Norman tower house located in Jenkinstown in County Kilkenny, Ireland. Located about 12 km outside the medieval city of Kilkenny it is a well preserved and restored Norman Tower House. Most of the bawn (outer) wall and some ancillary structures also survive in addition to the main tower. A pitched roof has been added over the centre of the tower, though the open-air walk along the tower's crenellated battlement has been preserved and is still accessible. A narrow spiral staircase connects the four stories. The remains of a moat protect the outer walls of the tower. The moat is believed to have existed since the original structure was built some time in the early 13th century. It is probable that the earlier building was incorporated into the present structure. Several stories are in circulation as to the haunted nature of the castle and it was visited in 1992 by a BBC television crew of British ghost hunters. The first legend concerns a female ghost said to look out from the castle windows; she is purported to be the daughter of a former owner of the castle, who, unhappy with his daughter's choice of lover, had her locked away in a tower, where she either starved to death, or was put to death by her father, depending on the version. The second ghost apparently makes a yearly apparition on 29 November, and is supposedly a guard who fell asleep on duty and was thrown to his death from the ramparts of the castle in punishment. His footsteps can be heard as he wanders the castle to make amends for his carelessness. The third legend concerns another female ghost, this time a woman who wanders the castle accompanied by the scent of wild flowers, or lilacs. "The Haunting of Foulksrath Castle". The Voice Magazine. Retrieved 2013-02-07.